This is a story of how I found my life in a book, and what happened after the final pages. The book in question was John Wyndham’s The Chrysalids (also titled Re-Birth) and I first read it when I was perhaps twelve, in snatches over breakfast or in the school dinner queue. As for many, my introduction to science fiction came around this time, reading my way through Asimov, Wells, Orwell, and, perhaps less commonly, John Christopher and Louise Lawrence. I fantasised about worlds beyond our own, worried alone about nuclear war, pondered the ethics of robotics when I should have been focused on algebra. The Chrysalids was different. The edge of panic started to seize me when I read it. I knew it was saying something deeply personal to me; was too scared to contemplate what. The novel is set in northern Canada, some years after a global nuclear war, in a society ruled by religious extremism which denounces any biological mutation or atypicality as the work of the devil. This is a world in which disabled people are either killed or sterilised, then banished from society. The book follows a group who are forced to conceal their telepathic abilities for fear of their lives. At the conclusion of the novel they are rescued by a woman from the island country of Sealand, where these telepathic abilities are both common and viewed as a positive stage in evolution. In retrospect, it’s obvious why this work was so important to me. I was both autistic and queer, only partially aware of both, in a conservative country where neither was acceptable. I tried—and failed—to find a balance between the inevitable violence that would follow any expression or exploration of my reality, and the slower, but no less destructive, intense denial of any sense of self. 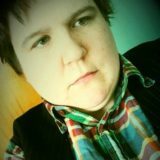 I spent my teens careering between rebellion and obsessive rule following, between internalised self-hatred and burning anger, eventually determining that no matter what I did, the parts of my person I did not yet know to call autistic would always be suppressed whenever they dared to show themselves. So the idea that there was something wrong with them, not me, that there were others like me, and that I would find a safer, happier life, were fantastically appealing for all the obvious reasons. No-one would be coming to save me, though. I had to save myself. I saved money from my Saturday library job, money from my grandfather, money from a summer employed removing staples from hospital records. I opened a dated school atlas and traced a route as far as I could go. New Zealand. Sealand. It would be a lie to say I picked my destination based on a fifty year old novel; language, climate, and the easy accessibility of a working holiday visa were my more immediate concerns. But the novel wasn’t far from my mind. I’d like to say I packed it and kept it with me the whole time but in truth I put it in a box of books I gave to my younger brother, taking satisfaction—if combined with a little fear—in purging as much of my old life as possible. And that’s where the story ended. I’d made my escape. There were people like me here, and I was safe. All threads wrapped up, a satisfying read. Except that wasn’t the end of the story. I was safer and happier than I had ever been, yes, and I began to find pockets of community, began to talk about myself, to claim the word “disabled” and understand how it related to me. But none of the science fiction of my pre-teens told me how to navigate the fact that even our refuges contain oppression and discrimination, and that every question I found answers to only yielded a dozen more. Nor could I leave my past behind as easily as I had once hoped. I doubted myself, questioned myself, used the terms that had been used against me—lazy, clumsy, useless—against myself. I experienced times that were deeply painful, that made me once again want to pack my bags and run, and sometimes I’d stare at a map and despair that there was nowhere further away to run to. And where things did become easier—or at least straightforward—for me, there were always others who were struggling. The forces pushing people like me down were perhaps not as strong, and sometimes avoided me altogether, but the more I built myself back up, the more I could see others around me being marginalised. The easy solutions fiction can provide are rarely present in reality. I began, too, to realise the flaws in The Chrysalids. It was inescapable that, in what I had read as a celebration of difference and a condemnation of oppression, the characters readers were invited to identity with were those whose mutations would either be inconsequential in our society (such as an additional toe) or could be thought of as super-powers (such as telepathy). Those who were more obviously different, or who experienced significant impairment, were presented as deserving of compassion but not as protagonists, effectors of change, or potential members of a sustainable society. And in the presentation of telepathic abilities as an advanced stage in evolution, Wyndham ends up reinforcing some of the eugenic implications he earlier seemed to challenge. I keep The Chrysalids—a new copy—on my shelf, and I reread it every few years. It’s a brilliant, important book for all its flaws, and it’s served me well. But here’s another thing that’s changed: when I want science fiction that I related to as a disabled person, I no longer have to grasp at anything which could possibly, non-literally be about people like me, and offer me a glimmer of hope. 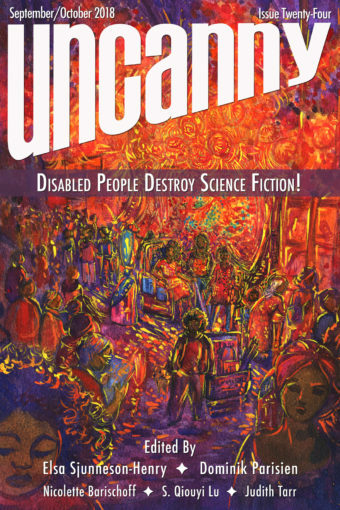 Part of this journey has been discovering science fiction by disabled writers that I relate to in more complex ways, stories where people like me are allowed to be directly and unambiguously on the page. Stories I don’t have to secretly claim, but are written—and waiting—for people like me.